Will this stop my dog from barking? No, the Bark & Activity Counter can be used to tell you how much your dog barks during the day, which can help you diagnose whether your dog has a barking problem or not. It can also help you figure out what your dog's barking triggers are. For bark collars that will automatically correct your dog when he barks, view our other bark collars. (1) On/Off – Hold this button for three seconds to power the unit on or off. (2) Mode – Use this button to scan between Bark Mode, Activity Mode, Time & Date Mode. (3) Toggle + – Scrolls up through your training sessions to view data on the display screen. (4) Scan – Once you are in the Settings, use this button to scroll between sub-sections. Example: For time, scroll between hour, minute, am/pm. (5) Toggle – – Scrolls down through your training sessions to view data on the display screen. (6) Reset – This indented button is hidden on the back side above the USB port. Use a pin, pen, paperclip, or other small tool to press this button and reset the device. Pressing this button will not clear the date and time information that you saved. (7) USB Port – Uses a standard USB 2.0 A to Mini B cord to charge the Bark & Activity Counter. Start/Stop – A combination by pressing the Mode and + Toggle button at the same time once to begin recording a session. Press again to stop recording a session. Lock/Unlock – A combination by pressing the Scan and - Toggle button at the same time once to lock the screen. Press again to unlock. The screen will lock automatically after one minute of inactivity. To turn the device on, hold the power button for three seconds. The device should always be hanging at the bottom of the collar next to the lower part of the dog’s throat. This is vital to tracking correct data. When charging your unit for the first time, please allow 2.5 hours for the device to fully charge, as indicated by the full battery icon. The battery should last for more than one week per charge. Press the "Mode" button until you see the clock icon flash. Use the “scan” button to change from hour to minute to AM/PM, then use the toggle +- buttons to select the correct time. Press the “Mode” button until you see Month/Date/Year icon flash. Use the scan button to change from month to date then year, using the Toggle +- buttons to select the correct date. The Bark and Activity Counter will register the general amount of activity produced by your dog during a session. Activity is not the exact amount of steps or distance recorded, but a general estimate based on your dog’s movement. 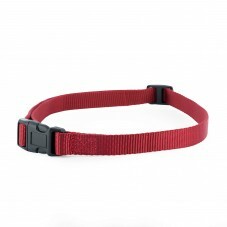 To get a baseline of your dog’s activity, put the collar on your dog and begin a session. (Please refer to the Using the Collar section of the User's Manual for instructions how to record a session.) Walk your dog for one minute at a normal pace, then end the session. Repeat this three times to achieve three sessions. The Bark and Activity Counter will show a number for your dog’s activity in each session. This shows your dog’s activity per minute when walking at a normal pace and will show the consistency of the counter. The activity recorded by the unit may vary depending on the size and gait of your dog. The Bark and Activity Counter works similar to a pedometer; for example, if you have a large dog, you may expect a lower activity level because the strides of a larger dog are longer. For a small dog, you may expect to see a higher level of activity because the strides of a smaller dog are short and quick. The data and graphs from the saved sessions will show any increases or decreases in the activity your dog produces throughout a session. Activity recorded will vary for each dog. The Bark and Activity Counter counts the actual number of times your dog barks in a session. In households of more than one dog or where there is excessive noise, these results may be skewed due to the necessary sensitivity of the microphone. In order to record the data as accurately as possible, make sure your pet wearing the Bark and Activity Counter is the only pet nearby and in a quiet setting. The Bark & Activity Counter counts the actual number of times your dog barks in a session. In households of more than one dog or where there is excessive noise, these results may be skewed due to the necessary sensitivity of the microphone. In order to record the data as accurately as possible, make sure your pet is the only pet in a quiet setting. The Bark & Activity Counter tracks the amount of activity of your dog during a session. This information is not recorded step by step, but is tracked consistently per session. Barking does not necessarily mean that activity should also be present in the data. Smaller dogs will typically produce higher activity levels than medium to large sized dogs due to their paces. In order to obtain an average sample size of movement for your dog, record a session while you are at home with him/ her so that you are able to monitor your dog’s behavior activity and compare it to your data.